The platform super-serves its core audience by featuring authors in videos from LA agency Standard Time. Medium, the platform well known for the written word, is using video to promote itself in its first branded series. The move comes six months after founder Ev Williams announced that Medium would stop using an ad-based business model, describing it as a "broken system." When Medium made the switch in January, it eliminated 50 jobs, mostly in sales. Publishers like Pacific Standard and The Ringer soon left, citing that they needed to make money. One exception was Think Progress, which exited the platform in June—but not because it no longer supported ads. Founder Judd Legum told Poynter that it’s because Medium wasn’t "being developed with publishers in mind." Now the platform is using advertising to endear itself to its superfans by highlighting the most prolific authors in an original video series that accompanies a publication of the same name. Dubbed "Noteworthy," the two-minute videos will live on both Medium, flanked by written profiles on each writer, social media and YouTube. They feature coder Quincy Lawson, social commentator Ezinne Ukoha and essayist Alana Massey. 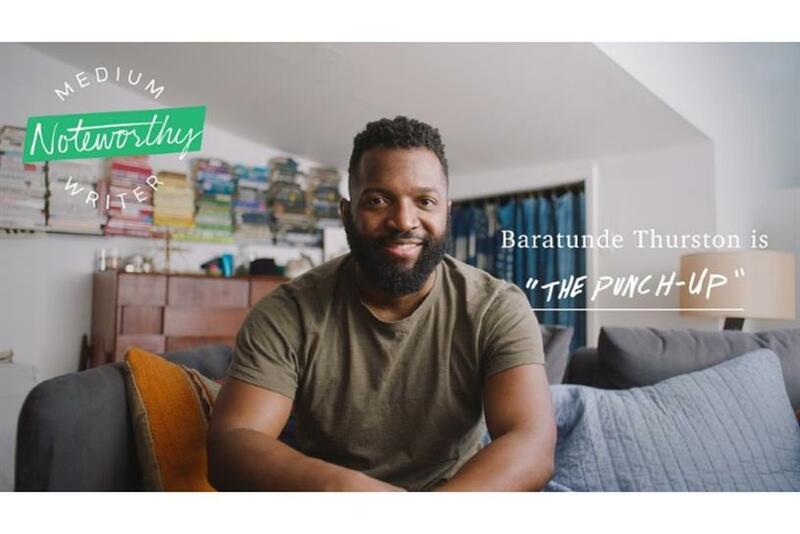 The latest spot debuted last week with comedian Baratunde Thurston. "With ‘Noteworthy,’ we were looking to build a platform that would help deepen the relationship between existing readers and some of our most visionary creators, as well as expose those diverse voices to readers around the world who might not be familiar with them," said Sam Duboff, Medium’s head of product marketing. "And when it came to think of how to execute that, a video is just such an immersive and emotionally potent way to showcase some of those visionary writers where you can see who they are, where they live, what they look like." To create the series, Medium, which doesn’t have a creative AOR, tapped Los Angeles-based agency Standard Time whose clients include Sephora and CVS Pharmacy. The inspiration, according to Standard Time founder and Executive Creative Director Michael Sharp, came from Americans’ obsession with athletes, musicians and movie stars. "We talk about their motivations, how hard they work on their craft, their training diets, how they maintain a competitive edge, but the power of the written word is something we wanted to put on a pedestal," Sharp said. With "Noteworthy," Medium and Standard Time aim to "to create a culture, talk about their motivations, their processes," and most importantly, "how Medium's really giving them an outlet for their point of view." So far, each video has only amassed around 4,000 views on YouTube but achieved a greater audience on Facebook with an average of 50,000 views. Despite the low YouTube numbers, Duboff considers the series a success. He points to the fact that all four "Noteworthy" profiles were among the 20 most recommended stories on Medium the day they were released, which is used by the platform "as a good proxy for the way it's connecting with our community." Plus, viewers are watching the videos all the way through, he said, "which is exciting for us because we really want to focus on telling a longer story of depth in each short film, that kind of depth and nuance that people expect from Medium, rather than just a short, quick clip." What’s more, Duboff said Medium is "definitely planning to do more video," but he’s quick to note that it won’t serve outside marketers, as in JCPenney will never clothe its authors in branded content. Instead, the platform plans to elevate some of the "Noteworthy" writers into the Medium’s new subscription program. For $5 a month, readers can unlock additional member-exclusive columns—both written and recorded audio—from writers like Thurston, which currently sits behind a paywall. And those monthly fees are then paid directly to those authors. "We are testing it out as readers get to know these authors," Duboff said. But even as Medium plans to produce more branded content to spotlight its writers, he said, "We're definitely not working on or thinking about any ad-supported models right now." If advertising is going into the content business, who will take care of the brands?